It is interesting after a "Cold Winter" how many people are totally surprised and confused. "Bakersfield never freezes!" "Why do your plants look so Good?" How do I cover my whole yard?" "When do I prune?" "If I water won't my plants freeze worse? Here are some general answers to some of the questions we get everyday. Hopefully clarifying some of the confusion. To begin our discussion, Bakersfield heat is not the main factor in killing plants. It's the cold. I think people actually get that it's hot and plant accordingly. The point that most miss is that every so often we get very cold. Even colder than this year. We have been known to experience temps into the high teens. Those are called "killer frosts". Think back and you will remember several......it seems about every 8-10 years they show up. That being said I doubt that it's the smartest choice to plant a "Tropical Garden" in this Valley. Some tropicals are fine. But let's pick some hardy plant material as well, so when it does get cold (and it will) we are not replacing Everything. Next, You don't cover the whole yard, there are many plants that take our temps just fine. Some even require chill to do well. Educate yourself to the requirement of each plant you choose. You will then know your "problem children" and what needs protection. Covering , spraying with an anti-transparent and plant placement in the yard can all help you successfully grow frost tender varieties. Out in open areas choose plants that thrive in our climate. Open up your "pallet" of plant choices and you can create a garden that is beautiful and will be much easier to maintain. Prune most dormant trees and shrubs in the Winter. 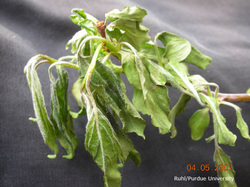 Do not prune frost tender plants until all danger of frost is over. Here, that could mean as late as March or April. Another note, Early Spring bloomers should be pruned after they bloom. Plants like forsythias, spirea, azaleas, camellias and lilac all should get their haircut after flowering. If you prune them in the Winter, No Flowers! Watering....Water your plants and trees well when they are dry. Dry plants will freeze harder than plants that are well watered. We do not get enough natural rainfall to grow much more than sagebrush and tumble weeds so be sure and maintain a "smart" watering schedule. Water long and deep when the ground is dry, check at least 6" deep and see whats going on below the surface.. My last point is that our Plants and Trees at Robby's Nursery look good because we follow all of these tips. We try and carry plants that do well in our climate, the exotic plants that can suffer in our cold we try and protect. Plants that do get nipped, we wait to prune until the appropriate time. And everyday our staff takes care to water what is dry and skip what does not need water. By following these basic guidelines, You too, Can have a great looking yard year round. Is it too cold to plant? Not necessarily, Plants that are not frost tender will benefit from planting now. The roots become established before Spring and you will get that burst of Spring growth. Also the more established the roots are before Summer heat the better the plant can endure. That being said, when you plant in the Winter you still need to do some hand watering on the newly planted items. Bare Root is here and available at Robby's Nursery & Calico Gardens. In Jan it is possibly to get some varieties with no container and no dirt......hence the name Bare Root. You can get these trees and plants for a little less cost as they are dug & delivered in mass quantities. Although, I think greater benefits are that they are just easier to plant and there are lots of choices. Get in during the cold weather or you'll miss out on Bare Root until next year. Don't forget the planting mulch!